The Northern District of California granted partial summary judgment to a defendant in a trade secrets case on the ground that plaintiff disclosed its information to the public in its published patent applications. Spring Design, Inc. v. Barnesandnoble.com, LLC, No. C 09-05185 JW, 2010 WL 5422556 (N.D. Cal. Dec. 27, 2010) (slip op.). The court rejected defendant’s argument that plaintiff’s UCL claim was preempted by the UTSA because “if the confidential information is not a trade secret, then preemption would not apply because the claim would seek a civil remedy not based on the misappropriation of a trade secret.” Id. *10. In 2006 and 2007, Plaintiff filed several patent applications which claim different variations of an eReader with a dual-display design, consisting of an electronic paper display (“EPD”) and a liquid crystal display (“LCD”). Id. *1. In 2009, Plaintiff and Defendant explored possible collaboration on an eReader, and the parties entered into a nondisclosure agreement (“NDA”) in which the parties agreed not to disclose, reproduce, transmit or use the other’s confidential information except to certain employees on a need-to-know basis. Id. From February to October 2009, Plaintiff and Defendant conducted several meetings and exchanged emails regarding Plaintiff’s eReader technology. 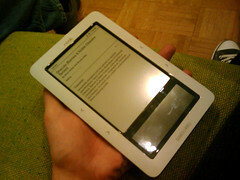 But on October 20, 2009, Defendant announced the release of the NOOK—its Android-based, dual-screen eReader. Id. *2. In 2010, Plaintiff launched its competing eReader device, the Alex, which is also a dual-screen eReader. Id. Plaintiff Spring Design, Inc. brought an action Barnesandnoble.com, LLC alleging, inter alia, misappropriation of trade secrets and violations of California’s Unfair Competition Law (“UCL”), Cal. Bus. & Prof. Code section 17200, et. seq. Id. *1.Plaintiff alleged that Barnesandnoble.com used Plaintiff’s confidential information to develop a competing eReader device, the Nook, in violation of the parties’ non-disclosure agreement. Id. The parties brought cross motions for summary judgment.